2840e/3850c/4450c/4480i: controller provides 24x12GB/6GB SAS/SATAII 4x16GB and 8 Gb/s Fibre Channel (FC) connectivity and native support for serial SAS and II (SATA 6Gb/s) disk drives – enabling it to power robust, yet cost-effective, storage solutions ideally suited for entry-level to a mide level and secondary storage requirement. Dual-active 3840 controllers are integrated into a SATAII drive enclosure, creating a fully featured 24-drive storage system in a 2U module. Up to 128 additional SAS or iSCSI drive enclosures are supported for a maximum storage capacity 2PB of storage with 352 disk drives. This entry-level controller delivers superior features and functionality to direct-attach (SAS) and storage area network (SAN) environments. Dual-active 4890 controllers are integrated into a SAS/SATAII drive module, creating a fully featured 24-drive storage system in a 4U enclosure. Additional SAS drive modules can be added to improve performance with high IOPS and capacity. The 3850c controller combines high-speed, industry-standard components with Nomadic robust firmware to deliver enterprise-class functionality and exceptional value. Each 4450c controller has two 8 Gb/s Fibre Channel host I/O ports (four per dualcontroller storage system) supporting direct host or SAN attachments. Its two SAS/SATA interface chips enable the 4450c to natively support up to 24 6GB SAS/SATA drives in the initial enclosure. 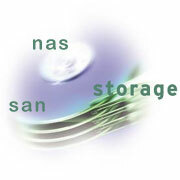 Additional capacity past the 24 SAS drives is achieved through the 3890’s 8 Gb/s FC expansion ports. There are two FC drive-side ports per controller, one of which is external. In dual-controller con•gurations these ports are interconnected through the midplane, creating dual drives loops that provide both controllers redundant access to all attached disk drives. The 4450c controller’s high-speed bus has the “width” to handle large-block I/O highest IOPS, and the “speed” to process small-block I/O. Its I/O system core provides built-in hardware XOR for high-speed RAID parity calculations – enabling the 4450c controller to easily handle this very compute-intensive task. And online con•guration, recon•guration, expansion, performance tuning and firmware maintenance enable “anytime administration.” All GVS enterprise controllers, from the entry-level 4480i iSCSI 10Gbit Option to the high-end, run the same firmware. This long-standing and •eld-proven implementation creates a lower total cost of ownership and higher return on investment by enabling easy integration of iSCSI in any mixed Server requiremnt “data intact” upgrades and recon•gurations, common features and functionality, centralized management, a consistent interface and reduced training and support costs, with GVS long lasting experince with storage market with on going R&D enabling to deliver customer with ability to run 99.9999% avaliblity as our track record has showen. RS-232 interface connector for troubleshooting & Diag.